What a red wine! This is an all-time favorite. 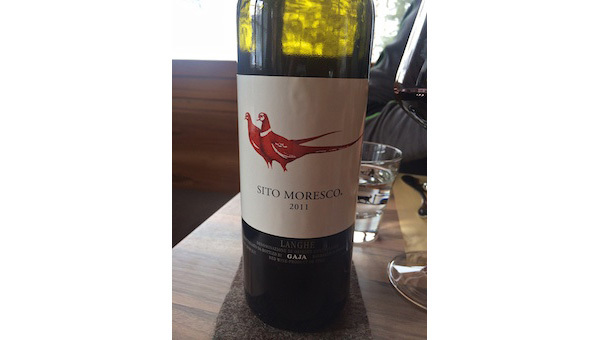 The Gaja Sito Moresco is a great value for the quality of the wine in the bottle. And while that’s attributable to the high quality wines that Gaja turns out, it’s also due to a great heritage in the heart of Piemonte. The wine is a phenomenal combination of Nebbiolo, Cabernet and Merlot, sourced from grapes in Barbaresco, Treiso and Serralunga d’Alba. The name of the wine means “the Moresco site” which is a former 25 acre farm in Barbaresco, who’s one time owner was Giovanni Moresco. Today, the vineyard is owned by the Gaja family. Price: $50 or a bit more. Because of small production, Sito Moresco can be a bit difficult to find. You can order from our favorite wine shops, Vinopolis, Sherry Lehmann or MacArthur Beverages or search Wine-Searcher.